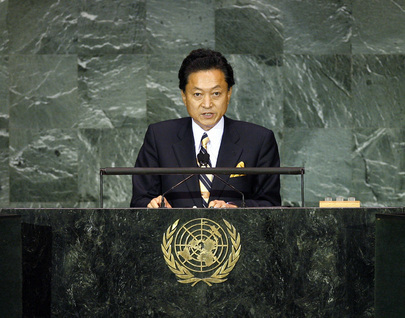 YUKIO HATOYAMA, Prime Minister of Japan, recalling his country’s 30 August general election, which had brought about a change of power, said his Administration embodied the dynamism of democracy, and it would exert all efforts to address domestic and foreign policy challenges. Indeed, the world faced various challenges, and Japan, following the spirit of yu-ai, or fraternity, would make utmost efforts to be a bridge between the Orient and the Occident, developed and developing countries and between diverse civilizations. Discussing five areas that Japan planned to address, he spoke first of measures to respond to the global economic crisis and explained that Japan must first revive its own economy. Abolishing provisional rates on auto-related taxes would provide 2.5 trillion yen in tax relief annually and enhance the cost competitiveness of Japanese industries. He also said international coordination would be needed to forge systems to reign in poverty and economic disparity, which would be difficult to coordinate by simply leaving them to market mechanisms. Japan would play a bridging role in international forums, including the G-20, in formulating common rules to that end. Regarding the second challenge -- climate change -- he said the path to creating a post-2012 framework would be anything but smooth. His Government had set an ambitious target for reducing greenhouse emissions 25 per cent, by 2020, over 1990 levels. It was prepared to provide more financial and technical assistance to developing countries than in the past, premised on the formulation of a fair international framework by all major economies and agreement on their targets. On the issue of nuclear disarmament and non-proliferation, he welcomed progress in negotiations between the United States and the Russian Federation on nuclear-weapon reductions, adding that it was urgent for all nuclear weapon-holding States to take concrete measures on nuclear disarmament. Japan continued to maintain the “three non-nuclear principles” despite its potential to acquire nuclear weapons. To ensure success at 2010’s NPT Review Conference, he urged taking action now towards the early entry into force of the Comprehensive Nuclear-Test-Ban Treaty, and early start of negotiations on a fissile material cut-off treaty. In that context, he said nuclear tests and missile launches by the Democratic People’s Republic of Korea posed a threat to peace and stability for the East Asian region and the world. He urged that country to fully comply with relevant Security Council resolutions, saying that Japan would continue its efforts to denuclearize the Korean peninsula through the six-party talks. Indeed, Japan sought to normalize relations with the Democratic People’s Republic of Korea through the comprehensive resolution of outstanding issues. On peacebuilding, development and poverty, Japan would work with international and non-governmental organizations to strengthen its assistance to developing countries in terms of quality and quantity. It planned to redouble efforts towards the achievement of the Millennium Development Goals and in the promotion of human security. In Afghanistan, he said Japan had provided assistance in such fields as strengthening the security sector and developing social infrastructure. To address the reintegration of insurgents, Japan would make vital contributions, possibly in the area of vocational training. As regional stability was also important, Japan had provided support for Pakistan and other countries in the area. Finally, he said he looked forward to an East-Asian community taking shape as an extension of cooperation built step by step among partners. He expressed hope to move forward on such issues as free-trade agreements, finance, currency, energy, the environment and disaster relief. Turning to the United Nations, he expressed his firm belief that Japan could play an even greater role in the Organization, and, above all, in the Security Council. Japan would continue to engage in the intergovernmental negotiations on Council reform, pursuing expansion of permanent and non-permanent membership, as well as Japan’s permanent membership on the Council.